Uncharted 4: A Thief's End (game, 2016). An action-adventure video game by Sony Computer Entertainment/SCEA. Developed by Naughty Dog. Official Trailer. Uncharted 4: A Thief's End is an action-adventure video game by Sony Computer Entertainment and SCEA, developed by Naughty Dog. 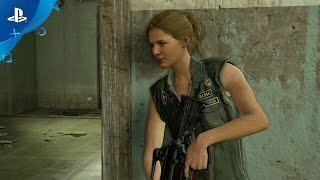 Uncharted 4 - Survival Trailer | PS4. The main character of Uncharted 4: A Thief's End is Nathan "Nate" Drake (Nolan North), a veteran adventurer. Following the events of Uncharted 3: Drake's Deception, Nate has retired to a normal life with his journalist wife Elena (Emily Rose) and taken up employment with a salvage company in New Orleans for his boss Jameson (Brandon Scott). Uncharted 4 introduces Samuel "Sam" Drake (Troy Baker), Nate's brother, who was presumed deceased. Drawn back into a life of adventure by Sam, Nate is aided by his old friend and fellow adventurer, Victor "Sully" Sullivan (Richard McGonagle). Their journey to recover the long-lost treasure of pirate Henry Avery brings them into conflict with wealthy Rafe Adler (Warren Kole), his ally Nadine Ross (Laura Bailey), who runs the private mercenary group Shoreline, and drug lord Hector Alcazar (Robin Atkin Downes). Child versions of Nate and Sam are voiced by Britain Dalton and Chase Austin respectively. Years before the events of Uncharted: Drake's Fortune, brothers Nate and Sam Drake hunt for the treasure of infamous pirate Henry Avery, who plundered $400 million during the 1695 Gunsway heist. Alongside their financier Rafe Adler, the Drakes infiltrate a Panamanian jail to access the former cell of Avery's first mate, where Nate discovers a hollow St. Dismas idol. Rafe impulsively murders the prison warden Vargas, triggering a frantic escape which sees Sam shot by guards and Nate fleeing, believing his brother to be dead. Fifteen years later, Nate has retired with his wife Elena, but misses the excitement of his old life. He is visited by Sam, who survived his injuries and has spent the intervening time incarcerated. He escaped with drug lord Hector Alcazar, who, entranced by Sam's Avery tales, has demanded that Sam find the treasure or be killed. Although reluctant to return to adventuring, Nate agrees to help Sam, but tells Elena he has accepted a salvaging job. Uncharted 4: A Thief's End is an action-adventure game played from a third-person perspective, with platforming elements. The player assumes control of Nathan Drake, who is physically adept and is able to jump, sprint, climb, swim, scale narrow ledges and wall-faces to get between points, swing with a rope, use a grappling hook and perform other acrobatic actions. Drake can use various weapons to attack enemies. Stealth elements are incorporated into the game, allowing the player to sneak up to enemies and attack them without being noticed, and has been further expanded upon from previous games, allowing Drake to mark enemies and hide in long grass. The melee combat system was reworked to avoid the presence of quick time events, and Drake can control vehicles directly. Uncharted 4: A Thief's End was scheduled to be released by Sony Computer Entertainment and SCEA on May 10, 2016.